SNAP! You are 20 miles into the backcountry skiing over 10 feet of snow and your skin/bindings/ski pole/whatever just broke. What do you do? Several feet of duct tape (also not pictured above – I wrap about a foot of it around each of my ski/trekking poles). I also bring along some other gear that I don’t classify as “repair” gear – like a small multi-tool and thin but strong cord (pictured in my article on emergency survival gear). With these items I feel like I can repair pretty much anything that can break when I’m in the woods. Ski/trekking pole break? Use a tent pole sleeve and zip ties or duck tape to hold it in place. Jacket/tent/backpack/gaiters/pants rip? Tenacious Tape is my hands down favorite piece of repair gear when it comes to fixing any type of “cloth” for both in the field and at home fixes. Skins not staying on? 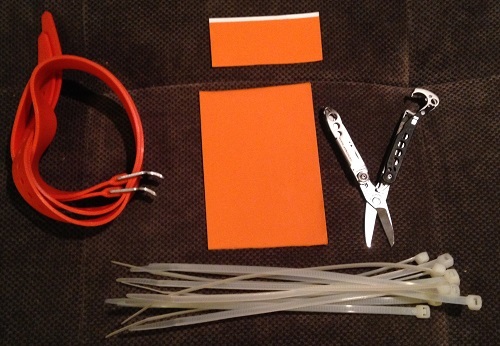 Wrap your ski straps around your entire ski and skin about 1/4 of the way from each tip. Bindings busted? You would be amazed with what you can do with zip ties (seriously don’t underestimate the power of zip ties – I’ve even used them to splint a finger). Crack your skis/snowshoes? A combination of zip ties to hold things together and duct tape to make then “smooth” again works great. Strap failing on your pack? Rock that thin cord and sew it back together. I could go on and on about how to repair various pieces of gear with the items I listed above. What is great about this repair gear list is that its extremely versatile. No single piece of equipment is intended to be used to repair a single item in my kit. All of it is multi use. To me this is really the key. If you think outside the box about how to fix your stuff and have a collection of repair material that can be used in a multitude of ways you can always rig up something to get you back on the trail. Remember – pretty doesn’t matter when it comes to trail repairs. Things just need to work. You can always make it pretty when you get home. This entry was posted in Activities, Alpine Mountineering, Articles, Activities, Backpacking, Gear, Gear Repair, Duct Tape, Gear, Gear Repair, Activities, Hiking, Gear, Gear Repair, Ski Strap, Gear, Gear Repair, Tenacious Tape, Gear, Gear Repair, Tent Pole Sleeve, Gear, Gear Repair, Zip Ties.